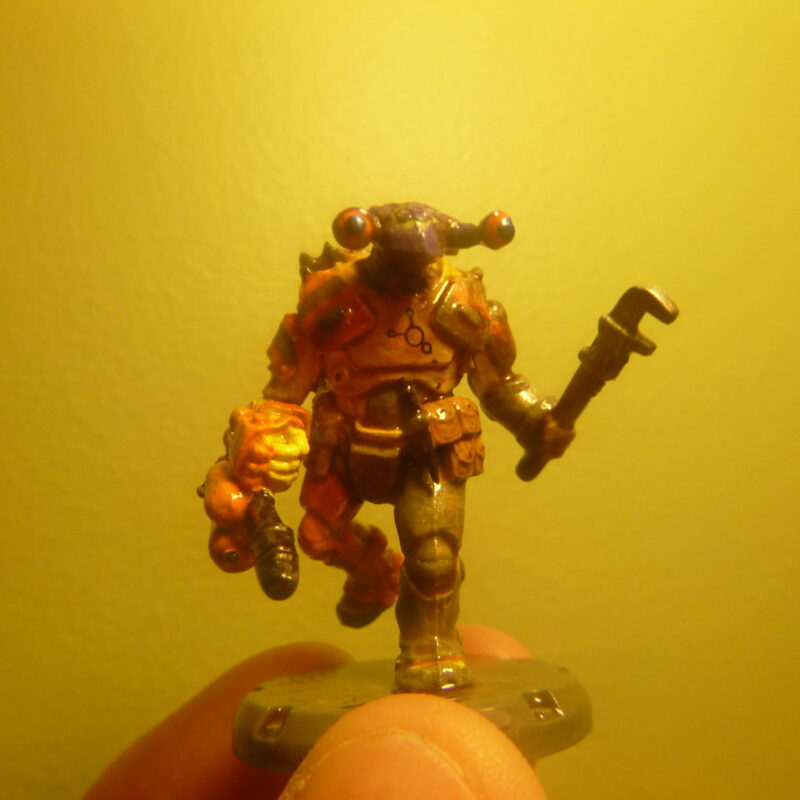 I took my next big plunge in modifying the Mechanic from Dust Tactics’ Corp Officers Heavy Rangers Squad with Hasslefree Miniature’s Alien Heads to make my first Oogappel alien. This is one of the custom races in my upcoming Science Fantasy campaign. I got two of the Corp Officers Heavy Rangers Squad pack for $4 from Asmodee in a Black Friday Sale. I liked how the Alien Head looked on the bulkier power armored miniature, makes it look like there’s an usual body in a pressure suit. The modification went great! I removed the default head, pinned the Alien Head in it’s place, and added in supporting flesh with Kneadatite. I wasn’t as satisfied with the paintjob. I was feeling confident with drybrushing but drying it this time taught me that I still have a lot to learn. I had more success with washes but, in general, I think it didn’t get quite the feel I wanted. 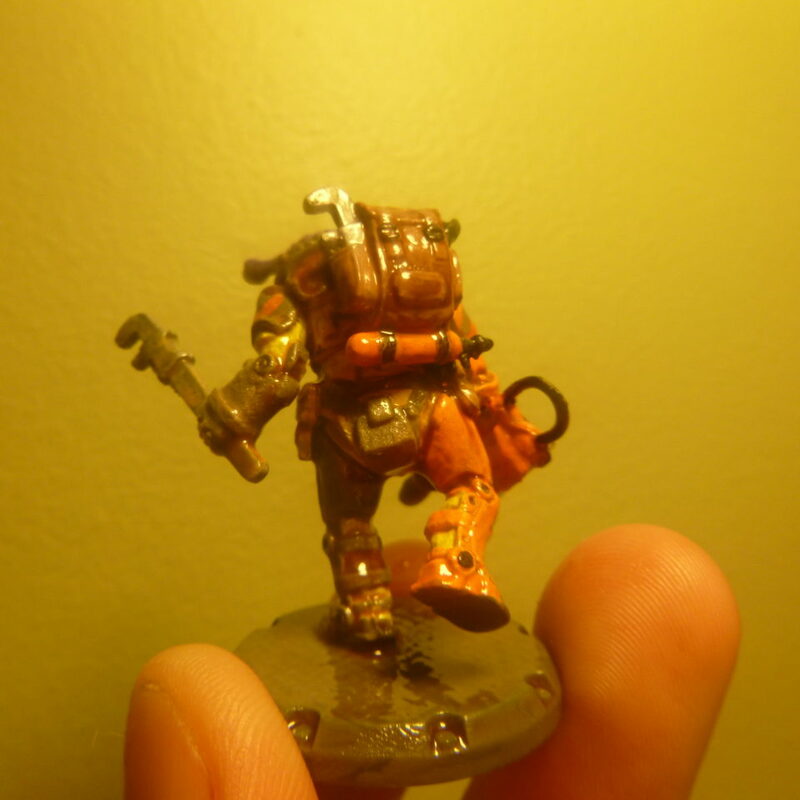 This was the first miniature that I added a decal too. I picked up several sets of Tau and Necron decals from ebay thinking that they make for great alien symbols. It was quite a process. I didn’t have a set solution but once I managed to get the tiny thing on (I lost two of them) it seemed to stick well enough. I secured it down with floor polish. Looking at it up close in the photo I see a couple of black spots that need touching up. End of the day… I think I need a lot more practice with drybrushing but the result is workable. After working with them, I have to note that I like the Dust Tactics miniatures and they are the most inexpensive that I’ve gotten since the Reaper Bones Kickstarter (granted – that was all due to the Black Friday sale).